Information governance is an essential part of how a modern business functions, overseeing how an organization approaches the data it creates, stores and uses. By governing how an organization handles information and by providing a framework for accountability, it ensures all requirements are met for compliance and security. Yet, getting it right has become more challenging than ever before. With the introduction of new technology (such as the cloud and big data) and new workplace trends (remote working), our information is at greater risk than ever before. There has been a huge increase in the quantity of data that organizations are generating, capturing and storing – including sensitive data. Unfortunately, as new technology is introduced, there has also been an inevitable increase in the ways that sensitive data slips through the cracks – and an increase in vulnerable IT systems for cybercriminals to target. Data protection legislation is being re-written in an attempt to safeguard all this data, putting pressure on businesses to adapt to wholesale changes regarding what they can and cannot do with their customer and employee data. What’s more, the heightened cybersecurity risk won’t be going away any time soon. Ultimately, this puts pressure on businesses to be incredibly diligent about how they handle information. Amid this flux, there is one thing we know for certain: robust, precise and comprehensive information governance is essential to becoming a successful digital enterprise. Because it is only through effective information governance that organizations can safeguard information, comply with new legislation, and, ultimately, unleash the potential of digital transformation. What does good information governance look like? Every organization will approach information governance differently, as it is the consolidation of various disciplines – bringing together data storage, security, compliance, privacy, archiving, finance, electronic discovery, document management, knowledge management, case management, risk management, business intelligence, enterprise architecture and more. The responsibility of information governance may be taken up by an individual employee or team (often HR, compliance or information management teams) within your organization; however, with so many crucial areas to consider, the responsibility should be shared across the organization. All employees must be responsible, to some extent, for handling data and documents in a way that is secure and compliant. However, for information governance to be a success, it should always be led from the top. Watch our recent webinar to get some practical strategies for information governance. 1. Find out where your information is – carry out an information audit to find out where your organization’s information is stored at present and historically. It’s important to identify where data silos have formed, so that these can be resolved. 2. Classify your information – figure out what data is important and what isn’t. Ensure that financial, legal, PII and any other sensitive data are classified correctly. 3. Provide a single source of truth – Establish one place to store all your organization’s information, so that employees know where to go to find what they need and where to save documents when they are working on them. Find a solution you can trust and is easy to use. 4. Take ownership of your data – make sure a team is established to own and oversee Information Governance. Make sure employees know what is required of them in terms of their responsibilities to save documents in the right place, to add metadata when required, etc. 5. Make it easy to store – employees should be able to save documents and information in a few clicks and be prompted to add the right metadata when appropriate. 6. Make it easy to search – enable intelligent search functionality. Make it easy for employees to find what they need to get work done in a few clicks. 7. It’s an on-going process – information governance is not a one-off project. You need to make sure systems are updated, for instance to deal with the latest compliance or security concerns. At harmon.ie we believe that successful digital transformation relies on humanizing the digital workplace. Too many of today’s digital solutions are focused solely on the technology and not on the people who will be using it. Our goal is to bring human beings back into the center of the discussion. Our solution for information governance is built upon that ideal. Centralize information governance – harmon.ie brings document and data management into Outlook, the place where your employees spend most of their day. Auto-capture information – harmon.ie lets you capture emails and documents from Outlook easily and store them in the correct places within SharePoint. harmon.ie now offers smart recommendations for where to store your important emails. Classify information – harmon.ie prompts users to enter the required metadata so that your information is classified correctly. harmon.ie now automatically recommends smart topics for metadata, saving your employees the need to figure out the best metadata values. Intelligent search – when information is classified correctly it becomes simple to retrieve documents and emails. 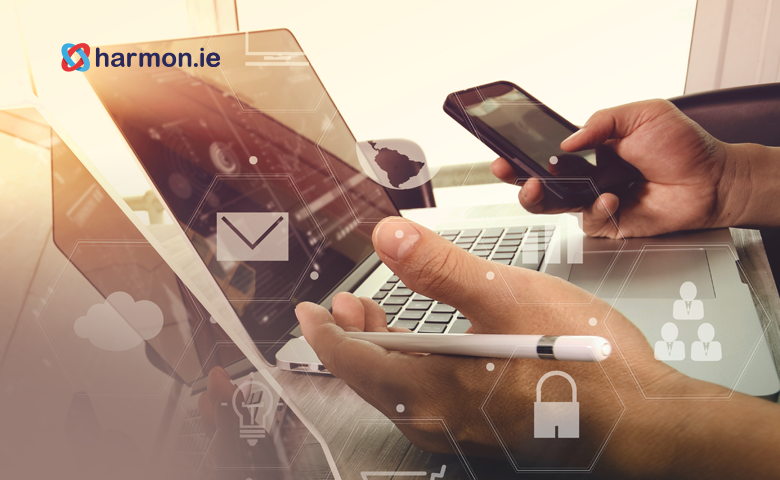 Flexible working – harmon.ie offers secure SharePoint and Office 365 access from any device so that you can capture, classify and search for information, in the office, or on the go. For more information governance tips or to find out more about how harmon.ie is humanizing the digital workplace, get in contact with us at harmon.ie today.